Gary Kurtz, Star Wars producer passed away on Sunday the 23rd of September at 4.47pm after living with Cancer for the last year. In the 70s and 80s Gary Kurtz was a young film maker that revolutionized the Hollywood film industry at its core with his films like Star Wars, American Graffiti and The Empire Strikes Back. The agreements he closed altered the balance of power from the film studio to the directors and producers so they could, for the first time, make the films how they wanted to make them and control the process of the art of filmmaking. In the mid 1960s Gary Kurtz was assistant director on a Monte Hellman western, Ride in the Whirlwind, starring Jack Nicholson, and went on to work on Voyage to the Prehistoric Planet with Basil Rathbone and Queen of Blood, with John Saxon, Basil Rathbone, and Dennis Hopper, and then on to another Monte Hellman western, The Shooting, starring Warren Oates and Jack Nicholson, and finally wore multiple hats as production manager, assistant director, and editor on the Harry Dean Stanton film The Hostage. Then in 1966 Gary Kurtz joined the U.S. Marine Corps where he served his country in Vietnam. This led him toexperiences in his life that would later directly influence his film making skills and story telling ethos. After leaving military service, Gary Kurtz moved into studio pictures, and became associate producer on Chandler and Two-Lane Blacktop with Monte Hellman for Universal Pictures, both in 1971. Kurtz's well-rounded skills in directing, editing, producing and storytelling made him the perfect partner for the young upcoming George Lucas when they first met through Francis Ford Coppola in 1971. This meeting led to a collaboration of these two film makers that lasted over a decade. Gary Kurtz studied religion extensively in his early years. In the early stages of development on "Star Wars" he suggested to Lucas that he might give the film a sufficiently universal religion to help to give it more depth. That led to Kurtz working on the "Star Wars" screenplay and developing "The Force" which would go on to influence generations of fans. Lucasfilm was born under their banner, and went on to make some of Hollywood's most successful films of all time. Gary Kurtz developed a good relationship with Universal Pictures off the back of Two-Lane Blacktop in 1971. Following that, George Lucas and Gary Kurtz brought a two-film deal to Universal for American Graffiti and a sci-fi film that was to be Star Wars. American Graffiti was a low budget movie and cost only $777K which was less than Kurtz's last movie Two-Lane Blacktop at $850K, but American Graffiti went on to take $140 Million world wide which made it the lowest cost to highest profit ratio film of all time and that record held until The Blair Witch Project in 1999. Kurtz now 33 years old went into re-negotiations with Universal Pictures to make the the second of the two film deal which was to be the Star Wars film. In the end Universal passed on the project because the script was not fully developed. Gary Kurtz later closed a deal with 20th Century Fox to make Star Wars for $11 million, and off the back of this Kurtz and Lucas set up the Star Wars Corporation. Gary Kurtz became Vice President of the corporation looking after the development of the film and also the film's other assets such as merchandising rights and products. Star Wars was to become a troublesome production which was complicated to finish. It pushed special effects technology and the art of filmmaking to the limit. In order to finish the film on time, Kurtz set up a second unit and directed many pick up shots, most of the cockpit dog fighting scenes, and most of the Star Wars opening scene interior fight sequences on Princess Leia's ship. He then went back to the US to work on the special effects miniature unit at ILM as they were struggling to complete many of the shots that were promised in England. At this point, George Lucas was not confident that they had a film to release, but in the end Star Wars was finally finished and unleashed to the world on May 25, 1977 and became one of the biggest films of all time bringing in over 1.1 Billion Dollars. Kurtz and Lucas carried on their partnership but they both started to have desires to make different sequels to the successful films they had already released. So, it was decided that Gary Kurtz would make the Star Wars sequel The Empire Strikes Back and that Lucas would make the sequel to American Graffiti, More American Graffiti. Gary Kurtz would join up with long time friend Irvin Kershner to direct Empire, the film again pushed all limitations in filmmaking technology. The film had twice the number of sets that the first Star Wars film did and a budget match of $18,000,000. Gary chose to film in icy Norway where he had served out his basic training in the U.S. Marine Corps. They filmed there during Norway's coldest weather in over 25 years. The production then came back to its UK home in Elstree Studios, but disaster struck when the the large sound stage there caught fire during Stanley Kubrick's film The Shining. Gary Kurtz again just got on with what was needed to make the film happen and negotiated with the studio to have a new soundstage built using Lucasfilm funding. The agreement allowed them to use the stage rent free and once the filming of Empire was completed the new soundstage was to be sold back to the studio. This saved on the production budget and only pushed the filming back by a few days. In the end, the film, Star Wars: The Empire Strikes Back was released on June 20th 1980. 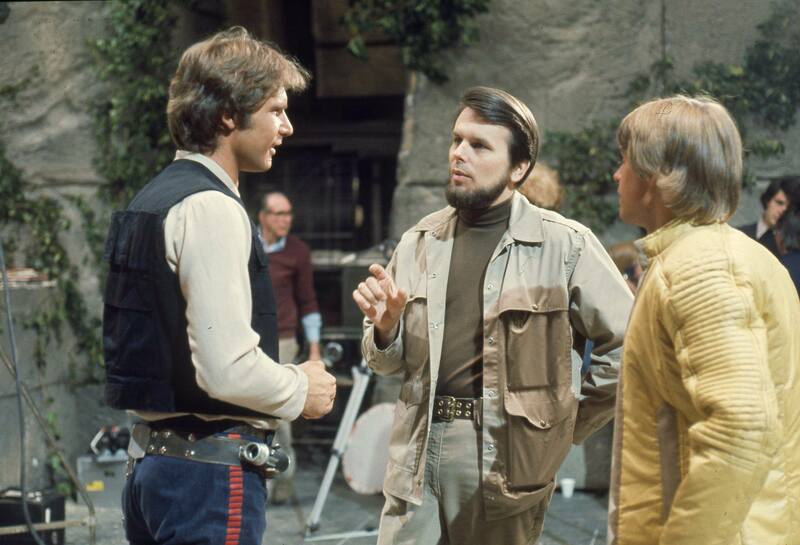 At this time Gary Kurtz started to feel that Lucasfilm had become too corporate as he often said there were too many suits in the production office that was supposed to be full of artistic people. That started to damage the strength of the Lucas / Kurtz partnership. Gary Kurtz was asked to produce Revenge of the Jedi (Return of The Jedi) and turned it down as he felt the script was too limited and that most of what was in the script had already been seen in the first two films (i.e. Another Death Star and the sand planet). He had worked on the Star Wars films for many years now and wanted to continue with changing the direction of filmmaking. Kurtz was living in the UK at this point and had made several interesting filmmaking friends there. He had been talking to Jim Henson about a big film featuring only puppets. This felt like a real challenge to him, which is exactly what he was searching for, so he joined up with Jim Henson to produce and second unit direct The Dark Crystal, a technical filmmaking masterpiece. Gary Kurtz's next big film was again not going to be easy. A long time friend, Walter Murch, had written the screenplay and was to Direct Return to Oz. Gary Kurtz Executive Produced it and it was critically acclaimed for its technical achievements with the room of mirrors. It was a very dark twist on the world of Oz and was released June 21st of 1985. Gary Kurtz went on to produce more films such as Slipstream (1989) with Mark Hamill, The Steal (1995), 5-25-77 (2007) and stayed working in the industry developing projects around the world including the far east and China up until his death, at the age of 78. Gary Kurtz was considered by many as a pioneer in the film industry and a master of the art of filmmaking. He found any opportunity to share his expansive knowledge of the film industry with budding filmmakers and those seeking knowledge. He was a real humanitarian and a gentleman; some have said that he is one of the gentlest souls in the film profession, modest and humble, and a very unique man. Gary Kurtz's art left lasting impressions on generations of adults and children across the world. We have him to thank for these wonderful memories that he made for us all. Gary Kurtz helped to create the force and it is with us always. Gary Kurtz left behind Clare Gabriel,Tiffany Kurtz, Melissa Kurtz, and Dylan Kurtz. Our thoughts are with his family.